Sitting here in the far north of Scotland, waiting for Storm Gertrude and its severe gales to arrive tomorrow, and with yet more heavy rain already falling, I’m starting to feel slightly punch-drunk with the weather that has been thrown at the north and west of the UK in the last couple of months. It all began back in the middle of November with Storm Abigail. Quite who in the Met Office had the bright idea of giving our storms names I don’t know, but at the present rate we’ll be through the alphabet in no time! 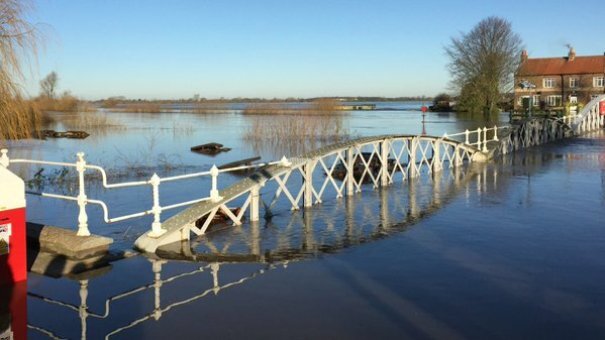 Abigail was closely followed by Barney, both bringing very high winds and considerable disruption, then at the end of November Storm Clodagh arrived, with more damaging gales and very heavy rain. 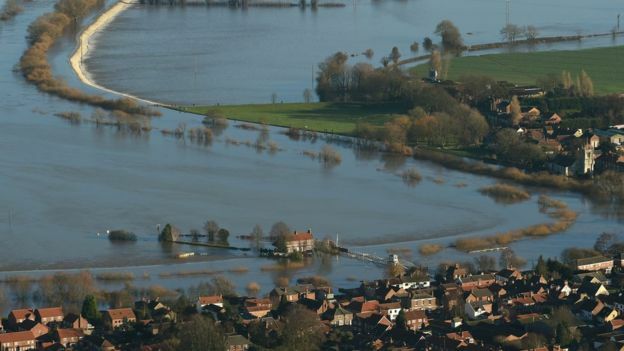 and caused the River Severn locally to rise to its second highest recorded level. 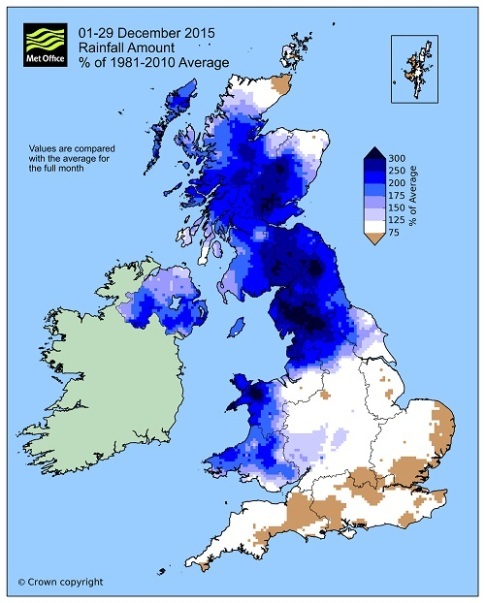 After a breathing space lasting less than a week, Storm Desmond brought unprecedented amounts of rain to north-west England and south-west Scotland in one horrendous weekend, with 341mm (almost 13.5 inches) of rain falling in 24 hours over the Honister Pass in Cumbria. 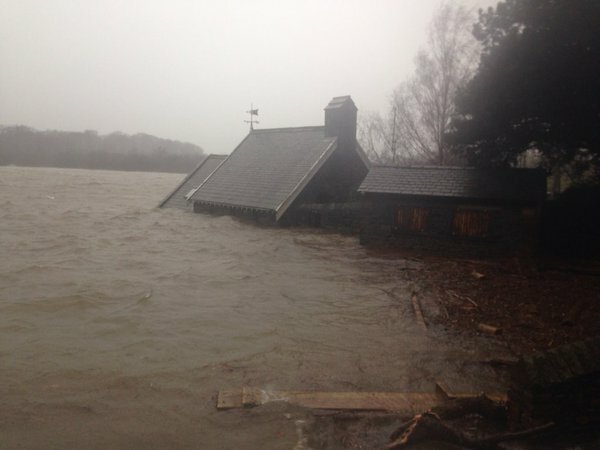 All over Cumbria and northern Lancashire rivers burst their banks and towns and villages were flooded, while tens of thousands of homes lost power, some for up to three days. After such an experience people could surely have been forgiven for thinking that the weather could only improve, but not a bit of it. The gales brought by Storm Eva on Christmas Eve were closely followed by intensely heavy rain on Boxing Day which led to swift, severe and record-breaking flooding in parts of Lancashire and Yorkshire. To bring the wettest December on record to an end we had Storm Frank just before New Year, bringing further severe flooding to many parts of Scotland. So far, so horrible, but this isn’t a weather blog, and to sound a more personal note our Christmas visit to DD and her family gave me a glimpse of what it must be like to live in an area prone to flooding. 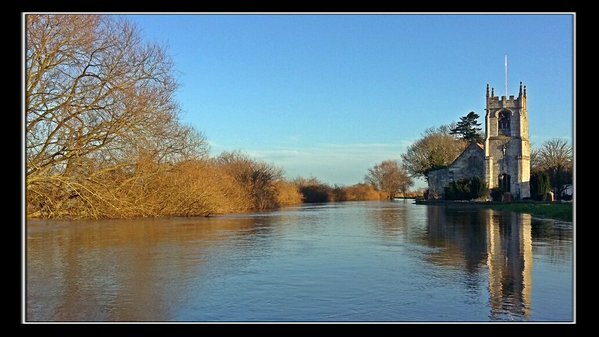 They live near Selby in the wide, flat Vale of York, a couple of miles outside the village of Cawood on the River Ouse. Some degree of flooding after heavy rain is quite common, as we saw on our New Year visit three years ago. However this time the Boxing Day cloudburst made the situation much more threatening. The next day being Sunday we had gone to church in the village (the church being very close to the river) and as soon as the service ended and the congregation began to leave, a very youthful-looking soldier came in and told us that they were warning people to move their possessions off the floor in case the water overtopped the flood defences. 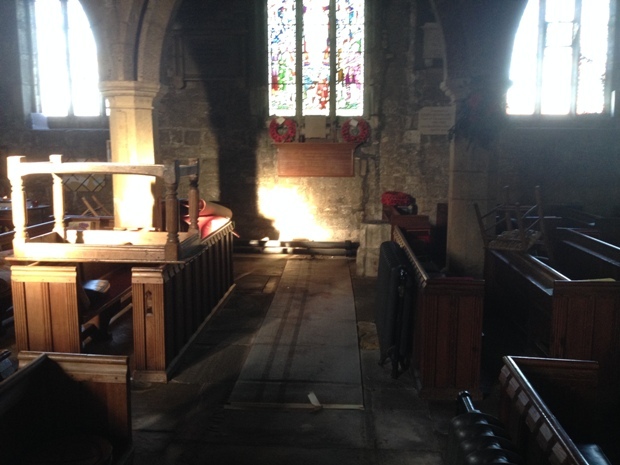 Everyone in church rallied round and carpets were rolled up and lifted, the piano was somehow manoeuvred up the step into the chancel and a couple of pieces of particularly old and valued furniture were lifted up on top of the pews out of harm’s way. When everything that could be moved had been moved, we came out of church to be greeted by a scene of intense and well-organised activity. 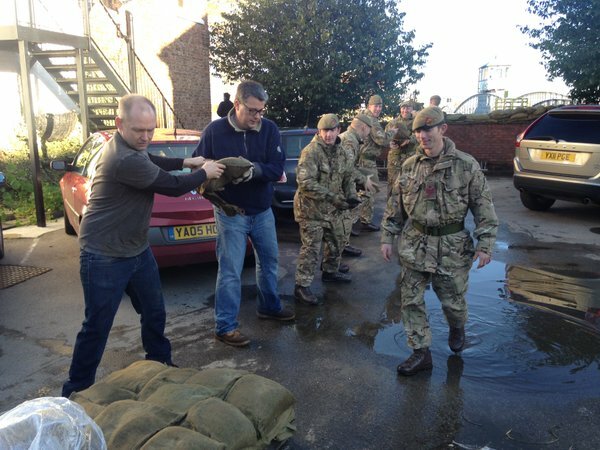 Soldiers and local inhabitants were working together to move large numbers of sandbags across the churchyard to raise the level of the flood defences between the church and the river by half a metre from 7.9 to 8.4 metres. As it turned out their strenuous efforts were well justified, as the water level peaked a couple of days later at 8.2 metres! In this low-lying area the flooding was very widespread, with farmers checking on their inundated fields by boat and an intrepid waterskier being filmed practising on the lake of floodwater along the Ouse. Cawood with the church at the right and water cascading over the defences into fields at the top left. Cawood bridge going nowhere. It has only just reopened a month later after repairs. As DH and I travelled home to Wales the next day, our radio listening was regularly interrupted by traffic announcements about flooded roads and cancelled rail services, which brought home to us how very disruptive such extreme weather can be to the everyday life of a great many people. As you may remember, our usual autumn visit to the glorious North-West Highlands had to be cancelled last year, so we have been starting to look forward to heading north again when spring arrived. In the meantime, having recovered from the round of family visits over the festive season, I was settling in nicely to a quiet winter at home when DH casually dropped a very small bombshell at bedtime last night. On our way to bed we stopped to look out of the landing window at the frost already forming on roofs and road and it occurred to him that the little house on the north coast hadn’t been winterised as usual. Except for the odd night or two of frost it’s been an unusually mild winter so far, but of course there’s no guarantee that this will continue and the last thing we would want would be to arrive in spring to find that we’d had a burst pipe weeks or months ago. It didn’t take us long this morning to decide that a trip north sounded like a good idea and since then I’ve spent the day turning the contents of the vegetable basket into soup for the freezer and generally getting ready for a spur-of-the-moment winter break for a couple of weeks.